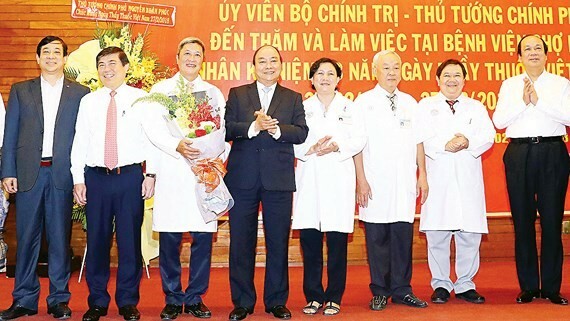 Prime Minister Nguyen Xuan Phuc on February 24 paid a visit and congratulated the entire staff of Cho Ray Hospital in HCM City on the occasion of 63rd anniversary of the Vietnamese Doctor ‘s Day (February 27). Prime Minister Nguyen Xuan Phuc congratulates doctors and medical staffs of Cho Ray Hospital. 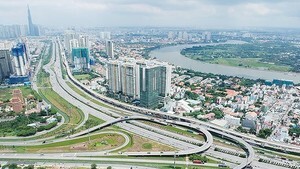 Attending at the event were Minister, Chairman of the Office of the Government Mai Tien Dung, Minister of Health Nguyen Thi Kim Tien, Chairman of the municipal People’s Committee Nguyen Thanh Phong and representatives of minitries, departments and state agencies. Prime Minister Nguyen Xuan Phuc said the hospital has continued to make efforts in providing treatment and health care to patients, underserving of the title of “People’s Doctor”. He also highly appreciated Cho Ray Hospital that had applied a number of advanced techniques in diagnosis and treatment during the last few years. The Prime Minister also praised achievements in the health sector and outstanding contribution of doctors and medical staffs of the hospital and health care units throughout the country to health care delivery in the communities. On the same day, the delegation also visited and congratulated doctors and medical staffs of Tam Duc Heart Hospital.